Institution Management - Microsys Software Solutions (Pvt.) Ltd. In this digital age, Information is playing a major role in our lives. The information is not only how we store the data but how efficiently we store it and how we use it in different ways. We will be providing a complete solution to a university’s needs. A complete package that will fulfill needs of a university for its internal management and working. 1) Complete management of all the activities involved from the admission to the convocation of a student. 2) Modular: Various modules like Library Management, Hostel Management, Faculty Payroll Management, Attendance Management, etc. can be added as per client's needs. 3) Fully customizable, i.e. you pay only for what you order. A dedicated team will customize the software as per the client's requirements. 4) Being web-based, the interface is universally accessible, i.e. Faculty can add assignments from their homes, while students can complete them and submit the same from their rooms. This eliminates the bottleneck problem faced by the current (so called similar) products that can be implemented only on a selected number of computers due to limitations of physical media. 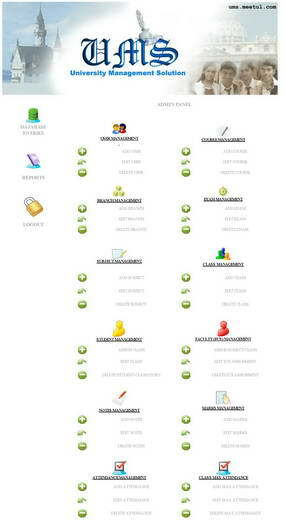 For this reason the faculty has to "book:" a computer loaded with such software in the institute's lab before he can use it, thus making the faculty reluctant and the system slow. On the other hand, the system we offer can be accessed not only by the internet connected computers but also from the PDAs and mobile phones provided they have web browsers installed. 5) Separate Module for Parents is also available, which will break the communication gap between the institute and the parents. Parents can not only view the reports, attendance and day-to-day performance of their respective wards but also take part in online discussions with the faculty. Faculty can send notices and messages to parents with a few clicks, thus saving the time and cost incurred while doing the same with traditional snail mail. 6) SMS Notification (optional): Students can be notified when they get new assignments, faculty can be notified when a student posts a question for them to answer, parents can be notified when a faculty sends them a message, all directly on their respective mobile phones. This will practically eliminate the "Information Gap" among the three entities. 7) Computerized Report Cards: When everything is being fed properly, round the semester in the system, it would not take longer than a few minutes to generate the report cards/marksheets of all the students of a particular class, which otherwise would have taken a few days to complete. This not only saves time while generating the real report cards but with the ability to generate it anytime, it gives a better overview of the performance of the class round the year. 8) Biometric/Smart Card Attendance (Under Development): No more proxies. A device will be fixed at the entrance of all the classrooms which will scan the smart card (which will act as identity card for the student) and finger prints of the student to verify that the person is whom he claims to be. This will save a considerable amount of time which is wasted in taking attendance manually, moreover, there is no chance of proxies and other errors. As the same smart card can be used at various places including Library, Hostel, Mess, Classroom, etc., this makes the system cost-effective too. 9) Multiple Courses: The same software is able to manage multiple courses (if offered by your institution), be it BBA, Btech, BCA, etc. 10) Multiple Nodes: If your institution has several branches in different cities (or in different countries) and you want a single interface for all your students and faculty, this software is the solution to your need. 11) Platform Independent: As the software is web-based, it can be implemented on a wide variety of operating systems including Windows and Linux. iii) Biometric (Finger Print) / Smart Card System. iv) Management of multiple branches of the same institute from a single interface.